In 2011, Google, Bing & Yahoo announced Schema.org which got SEOs all excited to start marking up website content to turn it into “structured data.” The benefit would be that search engines would be more certain that a text string of numbers was in fact a phone number, or at least they would be more certain that you wanted them to think it was phone number. The search engines could then turn the structured data into eye-catching fripperies designed to seduce searchers into surrendering their clicks and revenue to your fabulously marked-up site (aka “Rich Results). It also could help your fridge talk to your Tesla. So pretty much every SEO marked-up their audits and conference presentations with recommendations to mark up all the things. LSG was no exception. 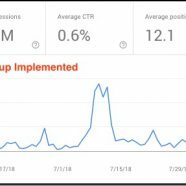 And we have seen it work some nice SEO miracles. There was the ecommerce site that lost all its product review stars until we reconfigured the markup. There was the yellow pages site that got a spammy structured data manual action for merging a partner’s review feed into its own. There is the software vendor and its clients that (still!) violate Google’s structured data guidelines and get away with it. There have been countless Knowledge Panels that have needed the tweaking one can only get from a perfectly implemented https://schema.org/logo. So less than one-half of one-half of 1% of clicks came from a “Rich Result.” Not particularly impressive. It also may just take time before Google trusts your markup. So before you drop everything and prioritize structured markup, you may want to consult Google’s Structured Data Gallery to get an idea of which types of content Google is pushing to markup. You also should check the SERPs to see what your competitors are doing in this area and how their marked-up content is being displayed. This should give you a good idea of what the potential is for your site. And remember,”you can mark-up anything, but you can’t mark-up everything…” – Tony Robbins? The post Structured Data Can = MehSEO appeared first on Local SEO Guide.